This green 30’s dress…it’s like she channeled my thoughts on the perfect day dress. As most ladies know and Tim Gunn has spoken out about, the clothing options for women over a certain size range are particularly limited, even though they make up hundreds of thousands of shoppers in the US and beyond and spend significant sums on clothing for themselves. Compound limited selection with a preference for vintage styles and your options are even more limited. 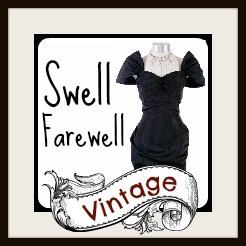 I’ve had my eye on New Vintage Lady’s Etsy site for some time and I did a post on her in 2011, but I’m excited to see that she keeps showing up on my radar and continues to expand her line of vintage patterns, offering fantastic designs that are all the things we love about jazz age and swing era clothing, with all the wonderful details that make them great (and she has a great eye! I love her selections, artwork, and fabric choices). This latest endeavor is via Kickstarter, in an effort to expand her size range to cover bust sizes from 40 inches to 52 inches, as well as improving her existing patterns in terms of graphics and descriptions. Offering a range of sizes is a lot of work – often, you only find one vintage pattern of a certain dress and it comes in the size you found, not a range, and it’s not simply a matter of adding inches around to increase the size, of course it’s MUCH MORE COMPLICATED THAN THAT, in that way that all of our bodies are a complicated mix of measurements. I LOVE a sailor collar. The obvious rewards here are reaping the benefit of the new patterns once the Kickstarter is funded, but if you don’t sew there is an AMAZING reward – the New Vintage Lady will make you a dress, one of HER garments from the Kickstarter! What could be more amazing and more personal and more lovely than that? (I see she also does men’s trousers *ahem* maybe…if you ask nicely?) If you’ve ever wanted a reproduction dress to your specifications with your fabric choices and you haven’t done this for yourself, this is a great opportunity to help not only yourself, but others of a certain size range to gain access to these wonderful patterns. There’s so much to love, go check out her line and video and consider backing this project! As you may have read in a post earlier this week, I wept tears of infinite sorrow that there were no Simon James Cathcart spectators in my size that I could order through SJC’s wonderful summer shoe Kickstarter, BUT THROUGH THE MAGIC OF THE INTERNET I have spoken with SJC and he has offered to make this shoe available to us sizes 7-8 US women’s/sizes 5-6 US men’s/sizes 4-5 UK men’s (I wear a US women’s 7) on one condition: he needs 8 of us to back the shoe at each size in order for it to be cost-effective for the factory to produce this size as a part of this run. I wasn’t sure if could rustle up enough support from people wearing these shoe sizes, but this is such a quality, unique shoe that I thought there might be enough lady dandies or gents with smaller feet that we MIGHT be able to pull this off. It can be any of the three colors, we just need 8 people to back the SHOE at each SIZE. Can I find 16 people who love this shoe and need it in their lives? I know you’re out there! They are made by hand in Northampton (the shoe capital of England) on 1930’s lasts, so the shape is there from the start. They will last a lifetime. How? They are “Goodyear Welted” (the gold seal of quality) which means as the soles wear out they can be easily replaced while the shoe remains totally intact. The shoes are lined in soft calfskin for comfort, with a super comfortable cork footbed so your feet breathe. They come in three gorgeous shades; Navy, Oxblood and Acorn – order whatever color you like, we only need 8 people to order a particular SIZE. The real bargain here is they are going to be 2.5 times this price out in the real world and if we don’t do this, the real tragedy will be they will never be in our size. NEVER AVAILABLE TO YOU EVER AGAIN. This is what 5:00 a.m. at RDU looks like. I see that Wearing History will be one of the vendors at Cal Bal (the California Balboa Classic) and thought this would be a good time to review the clothing I received from Wearing History as a result of backing their Kickstarter in August. It’s been fascinating following the manufacturing process after funding, with owner/designer Lauren Maringola giving frequent updates on the status of the fabric, printing, and the manufacturing timeline for each garment, among other details about working hands-on producing her made-in-the-USA line of 40’s-inspired clothing. I backed Wearing History at the level where I would receive a pair of the Smooth Sailing trousers in denim (yes, I bought pants! Also available in plus sizes.) and the Norma Jean blouse in a must-own-or-perish musical note print. The package arrived in the mail and was waiting for me when I got home from the holidays and Lindy Focus. It was my intent to wear the outfit dancing, but the Lindy Focus plague (née the flu) and my cat getting sick prevented me from attending any local dance nights between then and now – but I wanted to make sure my Cal Bal ladies and all of you could know about this great line of clothing! So instead of dancing, I decided to put my Wearing History outfit though another intense experience – a whirlwind trip to Hot Rhythm Holiday in Austin, Texas, where my band, the Mint Julep Jazz Band, would fly in, perform, and fly out in a period of 32 hours. 4 airports, 4 flights, shuttles, carrying baggage/equipment, eating my weight in Tex Mex food, and touring a bit of Austin before playing the Fed that night. A close-up of this adorable print! Just in case the glockenspiel case and traveling with 6 dudes carrying odd-shaped instrument cases wasn’t enough, the eighth-noted Norma Jean blouse would let everyone know that I was a musician and this was a band flying to a gig (and I was so excited, I’m sure I annoyed the crap out of everyone nearby). The blouse was actually a great travel piece and I imagine, for similar reasons, would be for dancing – it stayed tucked in with the darted waistline and high waisted trouser combo, the arm holes and slight dolman sleeve allowed for a wide range of movement, the tencel fabric was soft and durable, and the blouse could be dressed up or down, depending on the occasion. 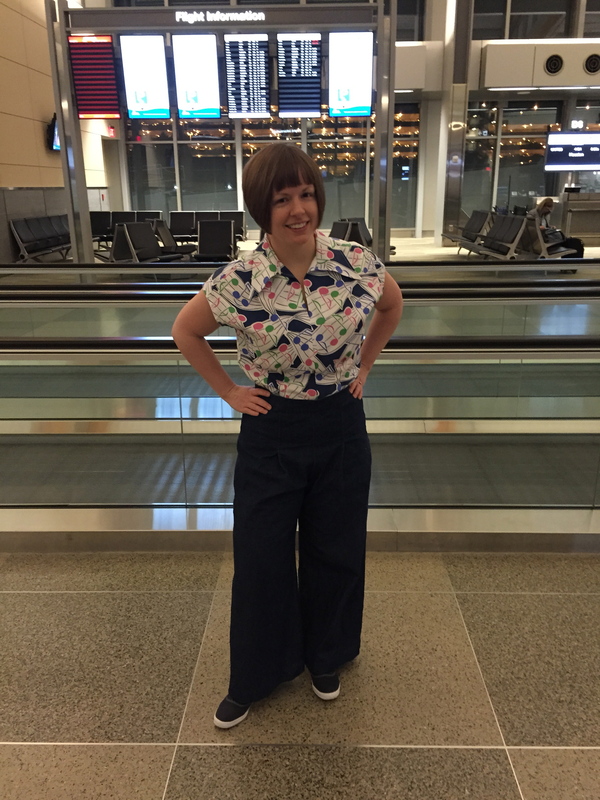 The Smooth Sailing trousers got the double travel treatment – I only wore the blouse on the first day, but wore the trousers for both traveling days. The weight of the denim is just perfect – not too thick, not too thin, and soft without losing its denim qualities. The cut is flattering, and I love the way a high waisted trouser makes your bum look. After two days on airplanes and sleeping on planes and in the airport, the trousers managed to retain their shape really well, with no stretch bubbles at the knee, and the only noticeable change was perhaps a little loosening at the waist, which may have been a casualty of my Tex Mex food baby. Two days in these pants and they performed like champs. I even slept in them when I got home – after a 23 hour day and 3 hours of sleep (with intermittent airport/plane sleeping) there was really no need to get into pajamas when the trousers were just as comfortable. And there you have it – Cal Bal ladies, do go by the Wearing History booth and check out this wonderful new collection of clothing and remember that Wearing History is just getting started! Everyone else, please visit the Wearing History website, where you can order these lovely garments, plus some other adorable garments from Wearing History’s first clothing line. I can’t wait to see what else Wearing History has up its sleeve and would back another Kickstarter in a second. Quality goods with great style! Wearing History Kickstarter – Get Your Pre-Orders In Now! 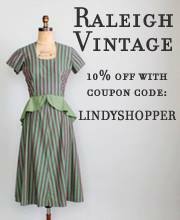 Wearing History has been a go-to referral for me when people ask about reproduction vintage patterns, but what if the clothing from Wearing History was already made for you (for those of us with less time and skills)? It’s happening and it’s adorable – the collection features 40’s style trousers, blouses, dresses, and a matching sash/head scarf, BUT before this collection exists, it’s got to have capital. The owner of Wearing History, Lauren Maringola, had the brilliant idea to use Kickstarter as pre-sales for the collection – for me, pre-sales are the best way to use Kickstarter because we backers are getting what we would have received anyway, only we’re actually helping make the entire thing happen! Her Kickstarter reward price points for each garment are comparable to similar reproduction garments I’ve either had made or purchased on Etsy. Please watch the video and read the summary – it doesn’t come out and say it, but basically these clothes were made for dancers – durability, practicality, and vintage style. Dudes – if the Kickstarter goes nuts, they might add a menswear line! Even better for our US readers, these garments will be made in the USA, so you are supporting the sustainability of the US garment industry. Some of the rewards are limited in quantity, so go get your order in now! Let’s do 2013 even better! Last year was the first year that Yehoodi live broadcasted all of the competitions at the International Lindy Hop Championships. The broadcast garnered over 23,000 views and had an international audience. This is no small feat! I had the pleasure of being a part of this landmark broadcast as a commentator during the Open Balboa competition and marveled at how dedicated the Yehoodi staff was to putting out a quality broadcast in spite of their small crew and minimal equipment. It was a lot of work, for sure, and I am excited to report that they are planning on doing it again this year. “For 15 years, Yehoodi.com has been providing, free of charge, an online home for the lindy hop community. We’ve run discussion forums, live events like the Basie Centennial, streaming online swing radio, and audio/video podcasts like the Yehoodi Talk Show, Hey Mr. Jesse and SwingNation. In all of that time, we have never asked for a dime from our members and viewers. Today is the first time on all those years we are asking the lindy hop community for support. ILHC logoLast year, we went to the International Lindy Hop Championships in Washington DC and produced our first live on-site dance competition show. Using basic production equipment and a skeleton crew, we were able to put on a high quality production that had 23,000+ views over the weekend, with viewers logging in from Korea, Sweden, Australia and many more countries. We heard from hundreds of you how much you enjoyed the live broadcast and the video archive later. This year, we think we can do even better. We have an opportunity to create a television-quality, high definition video production from ILHC. But we need your help. If I’m not attending this I want to be watching this! “We have already been approached by several event organizers to stream their competitions and showcases live to the internet. In particular, the team behind the Frankie100 Centennial Celebration have said that they would love for Yehoodi to be there in May of 2014 to stream some of that historic event to the world. With your support, that can happen. MORE BROADCASTS. We will be in a whole other realm of hobby at this point, with potential for a broader international reach, not to mention the ability to bring the events to people who aren’t able to attend them, to see MORE AWESOME DANCING.